Transport Canada has accepted Drone Delivery Canada Corp.'s declaration of compliance for the X1000 Sparrow cargo delivery drone. This unmanned aircraft system (UAS) is now compliant with the Transport Canada UAS standard. The Sparrow is the first cargo delivery drone of its kind to be accepted under the Transport Canada compliant UAS program. A compliant UAS is the first of three regulatory components to the Transport Canada-compliant UAS operator program and mandatory for a compliant UAS operator special flight operations certificate (SFOC). This milestone allows Drone Delivery Canada to move forward to becoming a compliant UAS operator with the anticipation for the balance of the other two of three approvals in early Q1 2018. Drone Delivery Canada has submitted the required documentation and is confident of its approval in the remaining steps. "Achieving compliant UAV status is the first of three very critical steps in Drone Delivery Canada achieving its compliant operator status certificate. We anticipate obtaining the balance of the approvals in early Q1 2018," commented Tony Di Benedetto, chief executive officer. "We are very thankful to the efforts of the Canadian government and Transport Canada in creating a favourable environment to grow innovative technology and position Canada as a leader in commercial drone delivery technology on a global scale." Achieving compliant UAS operator status is also the first requirement for being permitted to conduct beyond-visual-line-of-sight operations. This achievement moves Drone Delivery Canada to the forefront to conduct safe and effective drone deliveries in Canada. During recent research and development flights, the X1000 (Sparrow) has demonstrated a history of safe operation in some of the harshest environmental conditions in Canada's North. Drone Delivery Canada appreciates the efforts of Transport Canada in creating a favourable environment to grow innovative technology. Drone Delivery Canada Corp. was granted permission from Transport Canada to test its drone delivery technology in the northern regions of Canada. DDC tested its drone delivery platform in the Moose Factory and Moosonee communities, where it completed a series of successful flights comprising distances of up to 2.12 kilometres, all while maintaining visual contact. 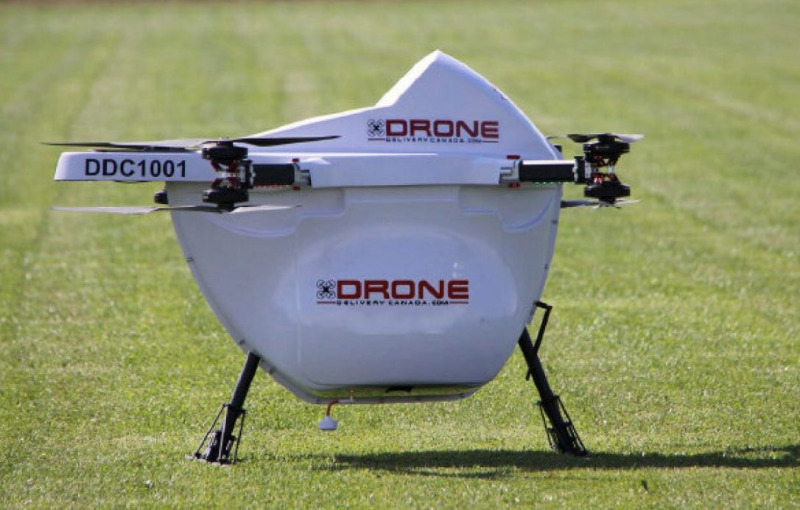 Drone Delivery Canada's Drones operated in Class E airspace, which has hundreds of daily helicopter and aircraft flights taking place. While flying autonomously, Drone Delivery Canada seamlessly integrated into this busy airspace. For these tests, Drone Delivery Canada's OCC (operations control centre) co-ordinated these flights with NAV Canada and Timmins FSS (flight service station) operating in VFR (visual flight rules). Multiple flights were made, all achieving 100-per-cent success rates while flying in some of Canada's most extreme weather conditions that included strong winds, snow and cold temperatures. "We are extremely pleased with our test flights in the Moose Factory and Moosonee communities," commented Tony Di Benedetto, chief executive officer of Drone Delivery Canada. "I would like to thank all stakeholders, including the communities, the regulators, the local aviation community and Drone Delivery Canada's technical team, to allow this co-ordinated effort to take place and achieve very positive results for all. Our technology has shown positive results through these initial flights to be a viable infrastructure solution for Canada's North to help increase access and reduce logistics costs," added Mr. Di Benedetto. Drone Delivery Canada will work under Transport Canada's guidance to continue to advance testing and development throughout the Canadian geography, including Moose Factory and Moosonee communities. Drone Delivery Canada Corp. has signed an agreement with Wolseley Canada Inc. to collaborate on the potential implementation of a drone delivery solution to expand Wolseley Canada's distribution capabilities. Using Drone Delivery Canada's logistics platform, the development, prototyping and testing will be focused on a customized depot-to-depot solution, as well as a depot-to-customer solution, in Wolseley Canada's supply chain. If the testing and development are successful to the satisfaction of both parties, the parties intend to proceed with good-faith negotiations of a definitive agreement once applicable government legislation is enacted (estimated in fourth quarter 2017 to first quarter 2018). Drone Delivery Canada shall be responsible for its own costs and expenses with respect to the testing and the development of the drone delivery logistics platform solution. "We believe that we are the only drone delivery company in Canada to successfully achieve beyond visual line of sight (BVLOS) testing and are very pleased to announce this agreement with Wolseley Canada, one of the leading plumbing and HVAC/R [heating, ventilation, air conditioning and refrigeration] distributors in Canada. As drone payloads increase, we think drone deliveries will radically improve on-time delivery," said Tony Di Benedetto, chief executive officer of Drone Delivery Canada. The Globe and Mail reports in its Thursday edition that Macquarie analyst Jiang Zhang commenced coverage of Drone Delivery Canada (70 cents) with an "outperform" rating. The Globe's David Leeder writes in the Eye On Equities column that Mr. Zhang targets the shares at $1. Mr. Zhang says in a note: "The evolution of drone delivery in Canada is inevitable as this theme is shaping up globally. We note that drone delivery is gaining traction in Africa, notably in Rwanda, where drones deliver crucial medical supplies and parcels over rugged terrains and areas that lack sufficient infrastructure. In China, e-commerce companies such as Alibaba and JD are already using drones for parcel delivery to rural areas. While drone delivery has been slow to take off in North America due to regulatory hurdles, the U.S. and Canadian governments are clearly interested in leveraging drone technology to drive greater efficiency. In Canada particularly, we think that the regulatory environment is improving as Ottawa is looking for ways to drive technology innovation given the country's shrinking labour force, outsized landmass and a resource-oriented economy. ... DDC is well-positioned for this theme due to its early-mover advantage." Nice pic, I think they call this the sparrow, so I guess when the hawk comes out it will be bigger?? Moose Cree First Nation and Drone Delivery Canada Corp. have entered into an agreement to commence a commercial program to provide the Moose Cree community with a next-generation logistics solution by drone. Working with federal regulators and community stakeholders, Drone Delivery Canada is set to commence commercial test flights within the Moose Cree geography which is located 20 kilometres south of James Bay in Northern Ontario. Various goods to be shipped will look to include mail, food, medical supplies and general goods. "We are very pleased to begin rollout of our drone delivery solution for the Moose Cree First Nation community," commented Tony Di Benedetto, chief executive officer of Drone Delivery Canada. "Drones provide immediate capacity building and provide an alternative to traditional infrastructure where none presently exist." Patricia Faries, chief of Moose Cree First Nation, said: "The air, land, waterways and natural resources are held in the highest regard by the Moose Cree, and using innovative technologies that could potentially allow us to move goods, provide safety services, and promote our Cree culture in new and exciting ways is at the forefront of any of our partnerships. We are excited to see the formation of this initiative, from pilot testing to potential commercialization and possibly building a business model. This technology is new, and we hope also to help our neighbouring communities address the high costs associated with the delivery of goods to their communities."